Two teenagers have been convicted of killing a man in a fight in Chester. 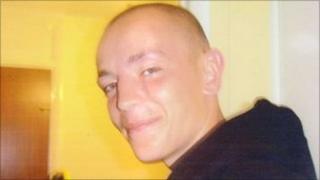 Christopher Garwell, 23, of Connahs Quay, Flintshire, was found with severe head injuries on 3 June and died in hospital six days later. Keiran Cunnah, 18, and 17-year-old Jordan Andrews, both of Blacon, Chester, were convicted of manslaughter at Chester Crown Court. David Tushingham, 20, of Blacon, was cleared. A 17-year-old admitted affray. Mr Garwell and a friend had spent the day drinking around Chester city centre and met the defendants. A fight broke out in the Charlotte Court area later in the day after a dispute over drugs, Cheshire Police said. The dispute continued later in the evening on the City Walls and Mr Garwell was found slumped and unconscious near King George Tower. He never regained consciousness. Det Insp Chris Warren, who led the inquiry for Cheshire Police, said: "This case demonstrates the devastating consequences that excessive drinking - and indeed drug misuse - can bring. "Christopher was the victim of a brutal assault when he was at his most vulnerable - in an unfamiliar city, under the influence of alcohol and drugs. "I would also like to thank those members of the public and local community who came forward and gave vital evidence to ensure that those responsible have been brought to justice." Andrews, of Melbourne Road, Blacon, and Cunnah, of Durham Road, Blacon, were remanded in custody and will be sentenced at Chester Crown Court on 21 December, alongside the 17-year-old, who cannot be named because of his age.